On December 8th 2016 the LGA hosted “A vision for finding the right services” workshop in Preston which brought together expertise from iStandUK, ieg4, Lancashire County Council, Chorley Borough Council and LGA themselves to set out their joint vision for a tool/app for finding the right local services. The workshop was nothing short of inspirational. This project and others like it could deliver significant victories in the public service provision shift to prevention and early intervention. What services would help me with my circumstances? What directory do I need to go to for the service I need? By framing the project in these terms it is possible to bring it down to granular level focusing on the needs and circumstances of citizens rather than a top down approach focusing on the service providers. Tim Adams was next to present and began by making the point that only once we know where the data is, who owns it, that is published consistently and that it is readily available to share, can we begin to allow the innovators get on with developing new service finding tools and apps. Delegates heard about the example of a standard schema for public toilet data in local authorities. Once public toilet is consistently recorded, published and shared useful apps like the Great British toilet map can be developed. Although a somewhat novel and small example of the usefulness of standardised data publishing in local public services, it served to demonstrate the scalable potential of service data. Tim went on to lay out the LGA’s vision for the crucial role that service listing, publishing and mapping can play against the backdrop of the wider public sector transformation agenda. If we succeed in this project and others like it, Tim posited, there will be significantly reduced pressure on frontline staff as there will be greater opportunity for prevention and early intervention with individuals who might normally present themselves at expensive statutory services. Tim concluded that if people knew what services were out there they would be more likely to get out of the house, do exercise, become less lonely etc. Following on from Tim, Paul Davidson presented on the work iStandUK have done for the LGA and others which lays the technical standards and framework for consistent and effective local service listing. Paul explained that a major challenge was the different ways in which local authorities and service providers, described, listed and recorded their services. Semantic and procedural differences in national and local services as well as differences between spoken and legislative languages were all barriers that had to be overcome. Paul went on to explain that, in order to overcome these challenges a way of consistently tagging services (data items) into nationally understood/recognised terms was needed. The LG inform tool was recommended for this. Delegates were then introduced to iStandUK’s proposal to consistently record and collate data items regarding local services. The LGA Schema validator that iStandUK had helped to build was demonstrated as a means to accomplish this. It enables standardised service listing and publishing in a CSV template with one column per data item. The tool is also available in XML and JSON formats which enable the building of a richer picture. We heard that it is vital for this project to include services which may not be in the local authority’s traditional powers, duties or requirements. At this point in the workshop we were introduced to the circumstances list/questionnaire which enabled users of to fill in their personal needs and circumstances in order to receive targeted information about relevant services. For example, they might answer… “I am a local resident,” “I am disabled,” “I have a 2 year old child.” The Circumstance list should then be able to determine relevant services that you are entitled to. For example you would be entitled a blue badge if you were and elderly/disabled driver whereas a disabled toddler would have different service needs and entitlements. 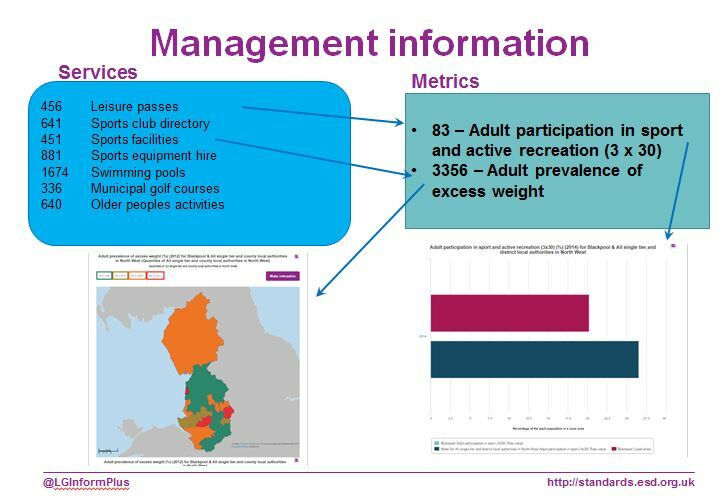 If this service was used by a large number of people in a single area, we heard, it also has the potential to be used as a tool to segment and map populations and geographies to allow for more informed policy decisions from local authorities and other service providers. This is a particularly exciting opportunity when it comes to switching the focus of health and social care to prevention and early intervention. If it becomes clear there are certain geographic areas with high levels of people recording loneliness for example, we should be able to begin targeting services and support more effectively. Everybody with even a passing interest in public service reform increasingly understands the need for radical demand shaping through preventative measures. Ian explained that once Tim and the LGA through down the gauntlet, facilitated by the standards worked on by iStandUK, ieg4 had been working to use the schemas and models to come up with viable software solutions which both improve people’s lives and help to free up service provider resources. Ian went on to demonstrate the app prototype to the group. He explained that the app had three main areas of service for self-help, carers and frontline professionals. The app will also feature an account function possibly facilitated by Gov.UK Verify which allows recording and tracking of an individual “My circumstances” page. We heard that it will be possible for a user to score, edit and track their own needs and circumstances. These inputs can then be mapped in a reactive quality of life diagram. This will allow a user to map changes/progression in key areas such as physical health and emotional wellbeing. A “my shortlist” page will then display appropriate services based on circumstances and self-assessment, there is also the option to apply/book services from this page. The prototype demo was an exciting visualisation of the potential of this project to make a real impact on citizen’s quality of life through empowerment, support and prevention rather than expensive, palliative interventions. Frontline trials for the app are currently planned in councils across North West England including Bolton, Lancashire, Chorley and Sefton. Finally, we heard from Chris Sinnott about the Chorley Public Service Reform Strategy. Again there a strong focus on the prevention and early intervention strategies that the Council was looking to develop. Chris acknowledged that the real transformative potential was in shaping demand to make services more sustainable rather than attempting to squeeze extra efficiencies out of supply. In order to do this we heard that collaboration between services and service providers was given the utmost importance. 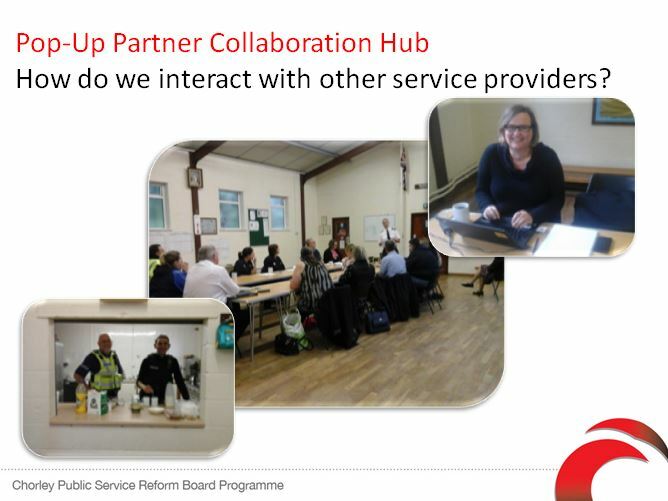 We learnt that Chorley had trialed so called pop up collaboration hubs in which partners in service provision within the local area based themselves from the same location (local scout hut) over a three day period. Over this period, there were sessions held each day where partners physically shared information with each other face to face. Partners involved found the project very constructive as it helped to develop understanding of the crossover between services and the opportunities that better collaboration could deliver. It was acknowledged though that, of course, this approach was resource and time intensive would not work practically for an extended period of time. What the project undoubtedly showed in relation to this session was that information sharing and knowledge management is critical service collaboration. When achieved successfully though, it is clear that well integrated services which centralise around individual people and cases can deliver immeasurable benefits. Chorley Council have set up a task group in an attempt to continue delivering the benefits of the same room Hub based approach but without the physical headquarters and daily face to face meetings.Chorley will also be involved in the service finder app pilot with special a focus on tackling social isolation. 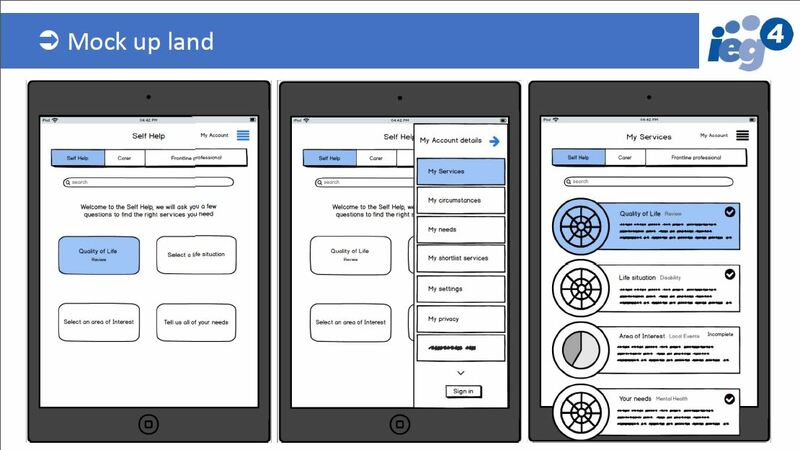 For more information about the service finder app, its development and access to presentations from the day, or to get involved in the project, please don’t hesitate to get in touch.